To qualify for a free subscription to Hydraulics & Pneumatics magazine, compliments of RHM Fluid Power fill out the application form below. 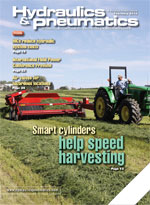 Hydraulics & Pneumatics is a monthly magazine loaded with the latest in fluid power technologies, products and applications. What is the primary end product or service preformed at you place of business? Do you specify, select or otherwise influence the purchase of components for hydraulic or pneumatic systems on new or existing machinery?